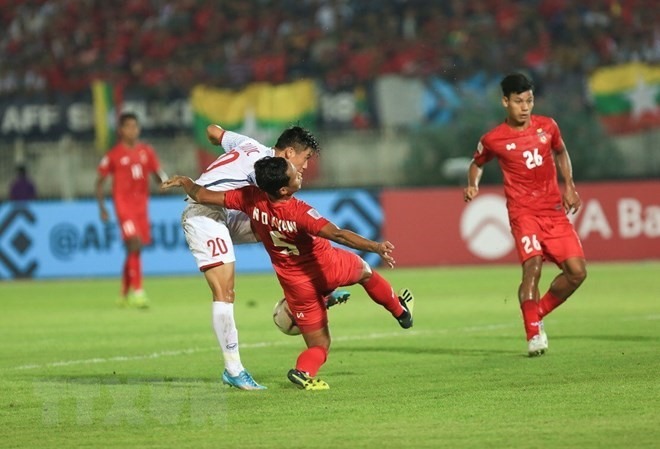 Việt Nam were held to a goalless draw by Myanmar in their third match of Group A in the AFF Suzuki Cup on Tuesday night. The match was held at Thuwanna YTC Stadium in Yangon, Myanmar. “Competing on away turf was really difficult, but the whole team completed their tasks well. I regret all the chances we had to score,” said Vietnamese midfielder Quế Ngọc Hải. “We tried our best in the match. Although playing away, we still saw the love of thousands of Vietnamese fans. I’d like to thank them very much,” Hải added. After three matches, Việt Nam and Myanmar both have seven points but Myanmar stand on top of the group on goals scored. Việt Nam’s chances of reaching the semi-finals still look bright as their next match is against minnows Cambodia at home on November 24, while Myanmar will face arch-rivals Malaysia away turf the same day. With support from home fans, Myanmar took control of the game from the opening whistle, and Vietnamese goalie Đặng Văn Lâm was forced into early action. Just five minutes later, midfielder Phan Văn Đức also blocked a goal-bound shot in the nick of time. After that, Việt Nam fought back strongly and had their first chance to score in the 20th minute through striker Nguyễn Công Phượng. Phượng of Hoàng of Anh Gia Lai was named one of the five best players on Match Day 3 by Fox Sports Asia. In the 23rd minute, Phượng rounded two defenders and passed to Văn Đức, but Kyaw Nanda was alert to the danger. The hosts responded with a long-range effort from Aung Lwin Moe, but Lâm was up to the task. In the 28th minute, a shot from Văn Đức was deflected from a corner, but he couldn’t convert the resulting set piece with a header. Two minutes later, Việt Nam won another corner, but striker Nguyễn Anh Đức and defender Đoàn Văn Hậu got in each other’s way while unmarked at the back post and the chance went begging. Myanmar got a free kick but it was lack of accuracy. After the break, Việt Nam’s head coach Park Hang-seo brought on midfielders Nguyễn Trọng Hoàng and Đỗ Hùng Dũng for Nguyễn Văn Quyết and Lương Xuân Trường. In the 47th minute, Myanmar’s key striker Aung Thu had a close-range shot blocked as the game went to and fro. Thu, 22, who plays for Police Tero in the Thai League 1, has scored one goal so far at the event. He won the AFF Youth Player of the Year in 2015. Two minutes later, Hoàng had his first shot right after being brought into the action but it was saved by the Myanmar goalkeeper. In the 64th minute, following confusion in the penalty area, Phượng, who is one of the top scorers for V.League 1 side HAGL, had a shot that hit the crossbar. In the 76th minute, South Korean coach Park made his final change. Striker Nguyễn Văn Toàn took the place of Phượng and had the ball in the net almost immediately, but it was ruled out for offside. Quang Hải had Việt Nam’s last chance of the game, but his freekick from just outside the target failed to hit the target. In the other match played yesterday, Cambodia beat Laos 3-1.